Humidity. It’s separating the men from the boys right now. Only last weekend I was forced to deride guests for scuttling back inside during a deck party. The key word I was trying to impress upon them was of course ‘deck’ – but this did nothing to shame them into compliance. For that matter, neither did the three-minute lecture on how East Coast natives born and raised in this sauna bath should be ashamed to let a California girl beat them in the annual Summer Endurance sweepstakes. But by that point I was lecturing the trees – everyone had already departed stage left. Even I can admit, however reluctantly, that the heat indexes are trying. From my desk in the morning, I peer out on miraculous shades of green under overcast skies and head outside with joy in my heart and a skip in my step only to be hit by a brick in the chest. Pleasure and pain wrapped up together like a Sartre play – and the pain is starting to trump all. 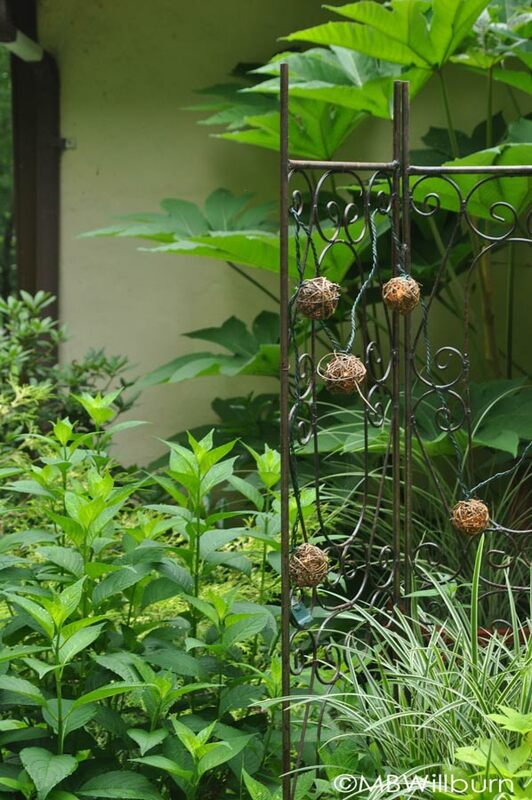 Gardeners often respond to environmental conditions without realizing it – heading in a direction over time that instinctually makes sense – even if a decision was never consciously made to move that way. That pretty much describes my journey towards tropicals and semi-tropicals as backbones of my deck and patio gardens. One day I woke up, looked around me, and realized that I’d headed south without ever leaving home. 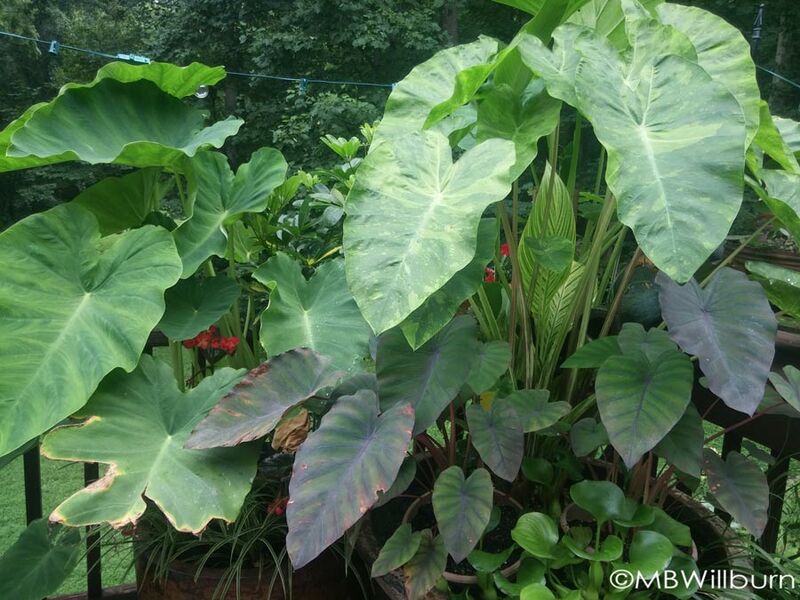 A mixed bag of colocasia, canna and water hyacinth make up a deck water feature. Somewhere in that luxury of foliage is a fountain. Petunias and Calibrachoa are all well and good when the humidity is below 20%, but eating your BBQ chicken while you stare at a centerpiece of sticky, mold-coated stems does nothing for the appetite. How much better instead to surround yourself with rain forest lovelies, hang a few strands of lights, crank up the Brazilian samba and celebrate the humidity that is making everybody around you a little cranky. 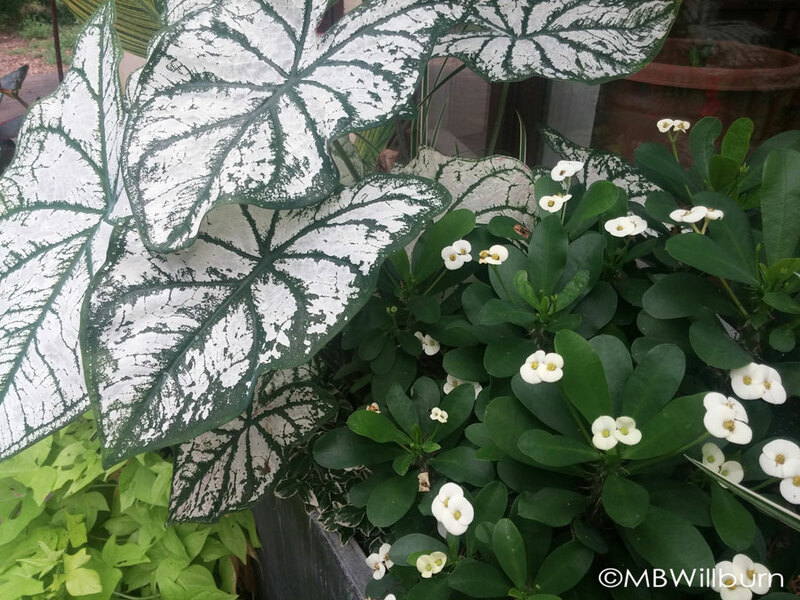 Faced with heavy rainfall and punishing heat and humidity – the hallmarks of the Mid-Atlantic summer – plants such as canna, colocasia, begonia, caladium, tetrapanax, banana, calla, petasites, etc…come into their own and keep my gardener’s heart beating. Each time I lose another Mediterranean herb to rot, I can at least pour myself a Rum punch, sit in the red-green shade of a potted Ensete maurelii and pretend my toes are splashing in Caribbean waters instead of a cheap plastic dog pool. 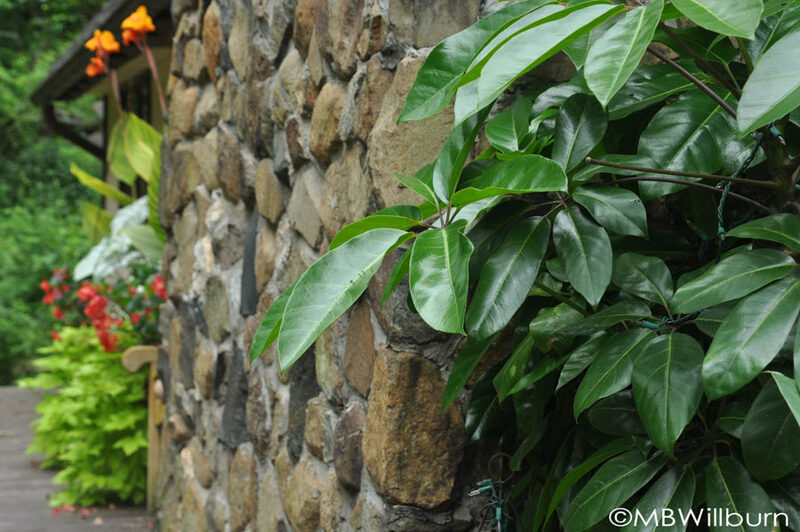 A large schefflera benefits from a season outdoors – in the background, the Pretoria canna are blooming in fiery orange. This, very typical, very trying, summer is all the motivation I ever needed to spend a little effort overwintering these plants. Some gardeners more profligate than I might just let them die and buy new stock next spring, but the fact that so many of these plants can sit practically naked in an unheated, unlit garage makes my choice easier – as does the fact that most of my tropicals are already potted in ceramic containers that benefit from coming inside during the winter anyway. 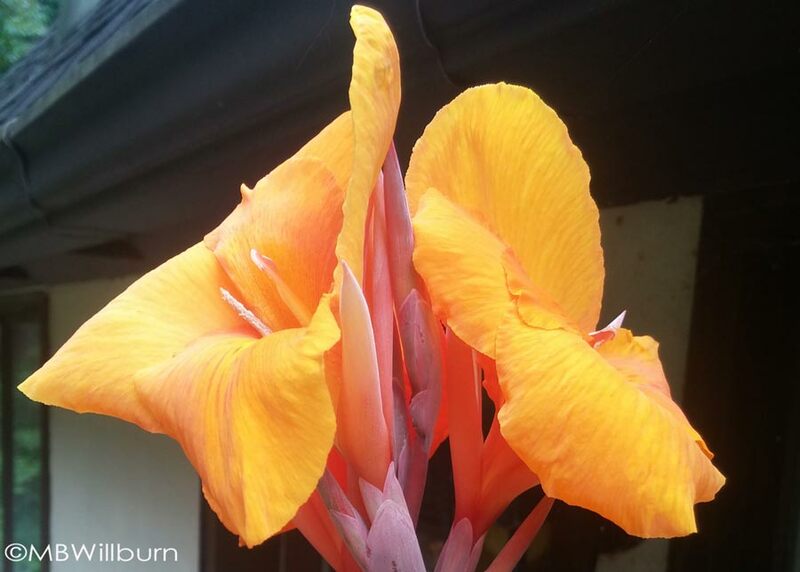 As if the foliage wasn’t enough, the blossom from Canna indica ‘Pretoria’ is a heart-stopper and makes this one of my favorite plants to grow. Some, such as tetrapanax and petasites are planted in the garden proper. They can squeak by in my 7a winter without protection. And before you gasp inwardly and head for the comments to righteously regale me with tales of woe and despair, I must tell you that both fulfill very specific needs in my garden. The former to seasonally fill out along a long, plain stucco wall where winter winds decimate anything with any height. The latter to mask the unsightly cement covers of our septic tank, and stabilize the bank of a creek with tough roots and invasive habits. Lurking in the background, Tetrapanax papyrifer ‘Steroidal Giant’ creates a feeling of lush, shady summers (and will take over the garden – beware). And so I will put on my best ‘what-doesn’t-destroy-me-makes-me-stronger’ smile, sip a tropical cocktail, and try to ignore the fungal diseases romping around my garden like it’s the 15th century. Curious if there is any sort of a guide for gardening in humid states like Texas. Do you know of anything? Aunt Jackie is having a very difficult time getting anything to grow there. I would definitely send her to fellow author/blogger in Texas – Pam Pennick at http://www.penick.net/digging/ – she knows her stuff! Awesome! I just emailed her the link. Hope she can find some good info there to help! Also ‘Garden Perennials for The Coastal South’, by Barbara Sullivan is one of the best. A great basic guide for those historically humid rainy hot regions. Not sure about central Virginia and their cold hardiness however, but SE Virginia is a historic solid zone 8 region, and due south from there.